Whoopi Goldberg and Raven-Symoné are made for each other because they apparently share the same opinion about not wanting to be characterized as African Americans. 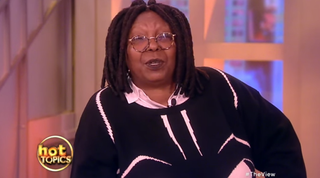 On Tuesday’s episode of The View, Goldberg echoed sentiments similar to those expressed by Raven-Symoné months ago. During a conversation, Joy Behar said there would be a mass exodus of people from the U.S. if Donald Trump won the presidency. The comment came after the women discussed Donald Trump’s newest anti-immigration ad. Goldberg didn’t exactly see the funny in Behar’s statement. A chick American? As opposed to a turkey American? Color me a confused African American. Of course, Raven-Symoné agreed with Goldberg, and they both received a round of applause from the audience. I guess 2016 will be more of the same from the “I’m not African-American” hosts of The View.